Back in the early 1960s, as Ford Motor Company product planners, designers and engineers were brainstorming ideas for a compact sporty car, there were numerous proposals for two-seaters. Most of those concepts never got any further than sketches, but at least one running prototype of a two-seat Mustang was built and survives today thanks to the devotion of Bill Snyder of Hudson, Ohio. The “shorty” Mustang, as it is often called, was designed by Vince Gardner and built in 1964 by long-time Ford supplier Dearborn Steel Tubing for a traveling custom car show. Now known as DST Industries, the company still builds and prepares many Ford prototype, concept and show vehicles. The owner of Ohio-based screen printing company Nordec Inc., Snyder has always been a sports car fan. Although Snyder was hugely disappointed, he nevertheless kept an eye out in case Ford ever did produce a similar car. It turns out patience truly is a virtue, and several years later Snyder ended up owning exactly the car he saw on that show stand. How did this car come to be? After choosing a Gale Halderman-penned two-door hardtop as the basis for the production Mustang in the fall of 1962, the Ford design team continued to look at possible alternatives for expanding the lineup. A convertible joined the hardtop at Mustang’s launch in April 1964, with a fastback coming a few months later. Body styles that were considered and rejected included a four-door sedan and even a two-door station wagon. Early on in the program, two-seaters were frequently pitched as potential replacements for the late, lamented first-generation Thunderbird, which by that point had grown into a luxury four-seat coupe. However, two-seaters then and now are niche products and Ford wanted its new car to have a broader appeal including young families, so the decision was made that the car would have four seats. Despite that, when an opportunity arose to build a custom Mustang for an upcoming traveling car show, DST brought in freelance designer Gardner to take another shot at a two-seat Mustang. It’s not known if Gardner ever saw or had access to rejected Ford design studio sketches, but the concept crafted by the DST team bears a strong resemblance to at least one sketch from February 1963. The resulting car is a Mustang fastback with 16 inches removed between the rear edge of the door and the rear axle. Working with one of the preproduction 1965 Mustangs that otherwise would have been sent to the crusher, the DST fabricators created unique rear bodywork from fiberglass and new outer door skins that incorporate the classic Mustang side scoop. 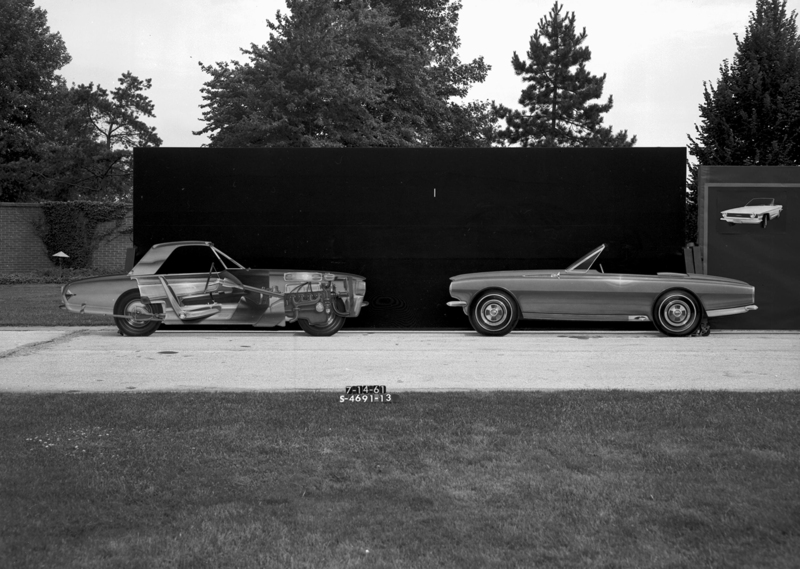 When the tour where Snyder had seen the shorty ended, the car, which was rejected for production, was set to meet the same fate as most such cars – the crusher. Not wanting to see this unique Mustang destroyed, Gardner stashed it away in a nearby warehouse. Several months later, after Ford reported it stolen and received an insurance payout, the warehouse owner discovered the car. Since Gardner had apparently not paid any rent, the insurance company that paid out the claim took possession of the car and later sold it to one of its executives. 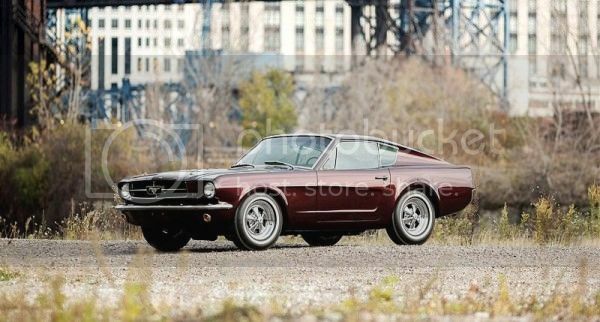 Four years after he first saw the shorty Mustang at the car show, Snyder spotted it once again, this time listed in the for sale section of Hemming’s Motor News. Over time, the original auto show lacquer finish cracked and the car was sprayed with body primer as Snyder accumulated about 15,000 miles on the car. Before it went on the show circuit in 1964, Ford engineers installed a special engine. The original 260 cubic-inch V8 that was available in Mustang was bored out to 302 cubic-inches and a trio of two-barrel carburetors were installed, making this effectively a prototype for one of the most beloved engine configurations in Mustang history. When Snyder decided to restore the car several years ago, his wife found some of the original color under the hood and worked with a paint supplier to match it exactly. Since it was a concept car, the original builders had used plexiglass for the quarter windows and backlight rather than cutting custom glass. Despite being heavily fogged after nearly 50 years, the restorers were able to buff the windows back to their original clarity. Looking as good as or better than it did in 1964, the one-of-a-kind, two-seat shorty Mustang made its debut at the 2013 Amelia Island Concours d’Elegance in Florida. This year, Snyder has been taking it to a variety of events celebrating 50 years of Mustang. This 1964 clay model of a two-seat Mustang incorporates some of the design cues of the production 1965 car including the side scoops. Early in the gestation of the original Mustang, Ford designers also considered a number of two-seater studies. These were seen as a more affordable return to the roots of Thunderbird, which by this time had grown into a much larger four-seater. The idea of a two-seat Mustang was something designers returned to frequently in the period between the original Mustang 1 concept and the 1992 Mach III. Aside from some track-oriented Mustangs that had the rear seats removed to save weight, there has never been a strictly two-seat production Mustang. How was the only Ford Mustang with only 2 seats, known as “Shorty” saved? That is a story just like those written by the Brothers Grimm. 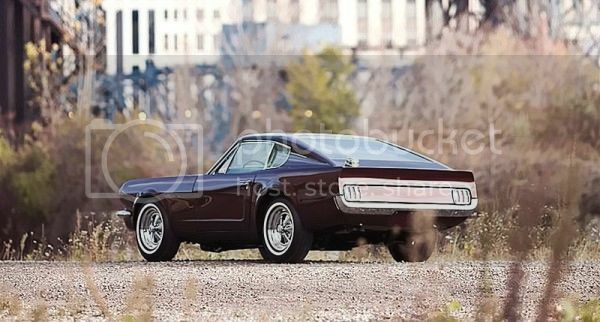 In the early ‘60s, the company Ford planned to develope a sports version of the Mustang with two seats. But, at that time Ford was still influenced by the former conservative president Robert McNamara, so chances for the production of this model were minimal. From the drawing tables, this wonderful car turned into a functional prototype and with an interesting game of the destiny it managed to “survive”, although it was scheduled for destruction. 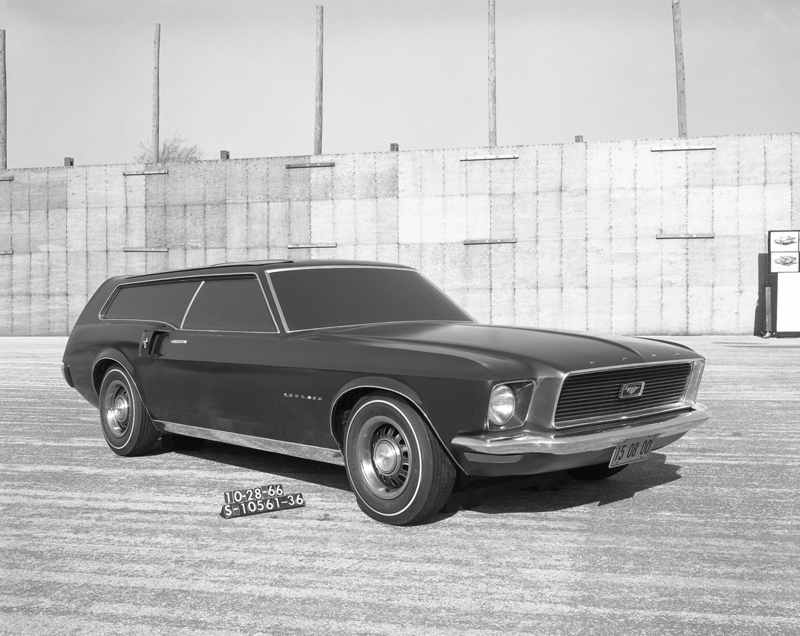 The prototype that was constructed by Vince Gardner was based on the pre-production model Mustang from 1964, it was shorter than the classic one by 16-inch, and the rear window was made of Plexiglas. After showing it to the US public during the tour in the USA, this nice “Pony” was scheduled to become scrap metal. Vincent Gardner was a technical genius, but just like every other genius he had a special, sometimes a little strange character. He was accepted and respected by his colleagues, but at the same time he was a loner who defended his ideas with great energy.